David's studio-based and theoretical work is mainly concerned with transformations in the experience of colour that have occurred with the development of new materials, and with their application in contemporary art. His three-dimensional works mostly combine brilliant colours (using fluorescent light, neon, plastics, etc) with a range of found light-industrial materials (steel shelving, commercial lightboxes, warehouse dollies, etc). He also produces drawings, and photographic series, and has made a number of large-scale works for public spaces. The blast of color coming from the column of 30-odd monochrome light boxes was unremitting. Viewed from any of the exhibition space's three floors (the column rose in a gap between the end of the flooring and an interior wall), David Batchelor's 33-foot-high Electric Colour Tower bathed the gallery in a pool of glowing light. Lest the work appear Minimalist, dozens of electric cables were left hanging down, each one buzzing as it imported electricity to its respective light box. These wires, along with the distressed look of the found boxes, gave the work its funk. The title of David Batchelor's first major solo show at a public institution, "Shiny-Dirty," neatly encapsulated the beat-up brilliance of his trademark stacks of reconditioned light boxes and fleets of low-slung, four-wheeled monochromes. Expanding on this title, the artist's description of his work in a catalogue interview as "dirty readymades for shiny monochromes" signaled a conscious engagement with two of twentieth-century art's most significant forms. Platform for Art is delighted to present an exhibition of new work by David Batchelor made especially for Gloucester Road Tube station. The exhibition continues the programme’s commitment to showing significant work by mid-career artists. 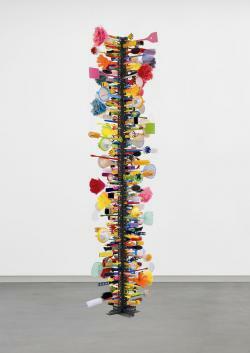 This exhibition conveyed Batchelor’s preoccupation with colour, through various kinds of structures, often assemblages of second-hand objects. Those involving light boxes explicitly referred to illuminated signs, the shapes and colours of a metropolitan environment. They embodied an essentially abstract phenomenon but a closer look revealed their nuts and bolts, wiring and other means of construction, and thus the artist’s pragmatism. Whenever I have seen work by artists like Cindy Sherman, Paola Pivi and Samuel Fosso displayed in Gloucester Road tube station, I've always wondered if commuters passing through actually differentiate between these images and the adverts that cover the passageways, ticket halls, platforms and trains around them. Which is why the current installation by David Batchelor is possibly the best thing Platform for Art have placed in this venue. 'Ten Silhouettes' is sufficiently different from the surrounding visual white noise to be – surprise! - unexpectedly soothing.